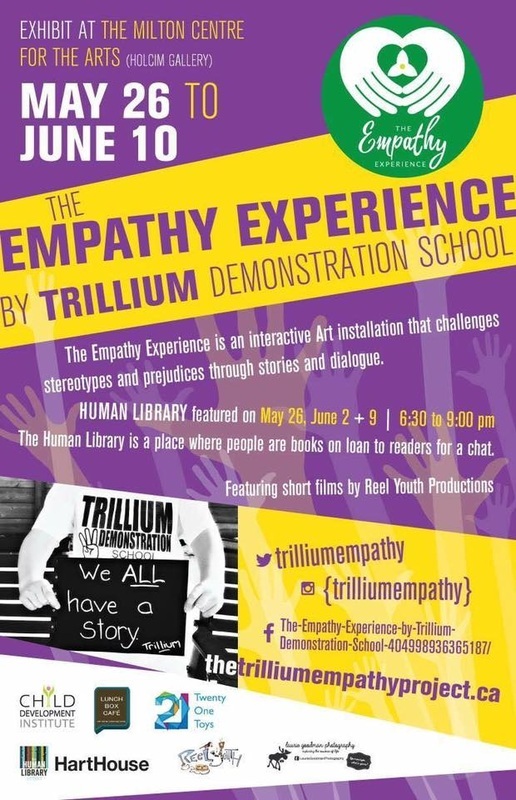 For the 2015-2016 school year, the students and staff at Trillium Demonstration School asked themselves a question: "How might we bring empathy awareness to our community?" Finding the answer to that question became a year-long, multi-disciplinary, inter-grade project that culminated in a two-week art installation at the Milton Centre for the Arts. Students started out by hearing the stories of others and by inquiring into the idea of empathy. Soon, they wanted to tell their own stories. The students who attend Trillium Demonstration School all have severe Learning Disabilities. They know first-hand what it feels like to be misunderstood, underestimated and marginalized. Students felt that sharing their stories would help build empathy by giving readers, listeners and viewers a rare glimpse into what it is like to live with a severe LD. The success of their personal story-gathering led students to want to reach out to other underrepresented members of the community and give them a chance to tell their stories as well. Students used digital technology (iPads, macs) to film, edit and publish. The culmination of this work was a two-week art installation at the Milton Centre for the Arts entitled "The Empathy Experience by Trillium Demonstration School. In addition to student and community stories, Life Message photographs, Reel Youth documentaries, a Human Library, a Braille interactive exhibit and the Empathy Toy were included. The event was covered in the local paper (www.insidehalton.com/whatson-story/6698112-trilium-students-promote-compassion-through-art/) and members of the community were invited to take part. The students at Trillium used digital technology to create connection and build empathy in their community and beyond.